Quality and Consulting - Quality and Consulting - kendo-sport - Der kompetente Kendo-On­line­shop. We from Kendo-Sport Team are ective ourselves and know how important good equipments are for intense trainings and important competitions. So we hope, that with our products and knowledge, can give you the best equipments for your Kendo! Here we would like to explain something to the special groups like Nito-Fighter, who wants to have the Shinai in the best quality, wanting to see what we have to offer. We have kendokas particularly in our hearts. We always try our best, to have the wanted equipments at wanted quality in our products, in which the special orders from women are tailored. Our articles are made by numerous producers, who have more than 30 years of experience producing for reputable Kendo companies in Japan and Korea. Because of this know-how, our goods are of consistent high quality. 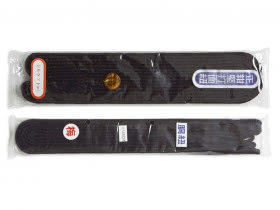 In comparison to other providers in Europe who purchase from wholesalers, we work together with our producers, who are known for excellent quality stitching and whose Bogu sets and Shinais can be purchased in Europe exclusively through kendo-sport. We are thus proud to be able to exclusively offer the Nibondo AAA Shinai and two handmade AAAA Shinais. Our Bogu sets have set a new quality standard. Our immediately deliverable 2 mm Bogu sets are produced exclusively from #8800 quality cotton, a quality level that, as a rule, is available from most other suppliers only for handmade Bogu sets. Many know us through Ebay and have been satisfied with our delivery, price and quality there. The many positive assessments there helped to make kendo-sport a member of the Ebay power-seller program, which allows us to display the power-seller logo. Given the success of that, we have expanded and developed this shopping site. Here, too, we will of course continue to offer expert consulting. Here, no one buys blindly. All of our articles are photographed and thoroughly described. All photos are taken and written by ourselves. They are thus completely identical to our goods! We have a genuine WYSIWYG principle: What you see is what you get! 5. What are customers saying about us? "Problemlose Abwicklung, gutes Preis/Leistungsverhältnis, gerne wieder"
"Beratung, Service... besser geht's nicht!" "Ware: Sehr Gut, Lieferung & Versand: Gut, Kontakt: Sehr Gut"
"WOW WIE SCHNELL DAS GING, ECHT SPITZE!! TOP GERNE WIEDER"
"Preiswert & gute Qualität -> die Kundenbetreuung ist 1A!! :oD"
"blitzlieferung! top ware! bin begeistert! gerne wieder!"